For some reason I've always had a connection with Sligo. As a child I loved when we drove on the Boyle road and would drive over the "three sisters" bumps! The butterflies in my tummy were something I actually looked forward to! Hearing stories of Irish legends, Fionn Mac Camhaill, Diarmuid and Grainne, and Queen Maeve, as we travelled through the county gave Sligo an air of mystical beauty. As an adult we chose to have our wedding reception in the light filled Castle Dargan Hotel. Where on a beautiful sunny July day we looked out at green undulating hills. Now again I have found another element to Sligo to love. The stunning coastal section of north Sligo. After we drove through the ever growing town of Sligo we took the coastal drive to Donegal. Our plan was to make one or two brief stops but like all good plans that quickly changed. We stopped at Rosses Point and had a lovely view of Benbulben. We also had a stop at Mullaghmore where the very scenic bay is backed by hills. But our favourite spot was just over 3 kms from the town of Grange. We came across the most beautiful 3 km long, sandy Streedagh Beach. The beach itself is a sandbar which links Streedagh Point to Connor’s Island. With the Wild Atlantic Ocean providing perfect waves this area is a hit with surfers. The sand dunes which divide the beach from the estuary provides opportunities for naturalists who can study the flora and fauna of the sand flats and salt marsh. As we didn't fall into either category we found a third reason to love this beach. 3km of flat sand allowed our two year old, Eli, to run wild! The small sand dunes meant he could safely climb and think he was a mountaineer! Sea gulls were flying over head and waves tumbled the Saturday morning surfers. Our two month old, Jake, slept in the sling to the sound of the crashing waves. And the wind woke up two sleep deprived parents - what is not to love!! I would highly recommend a visit to this discovery point along the Wild Atlantic Way. Places like this are good for your soul! 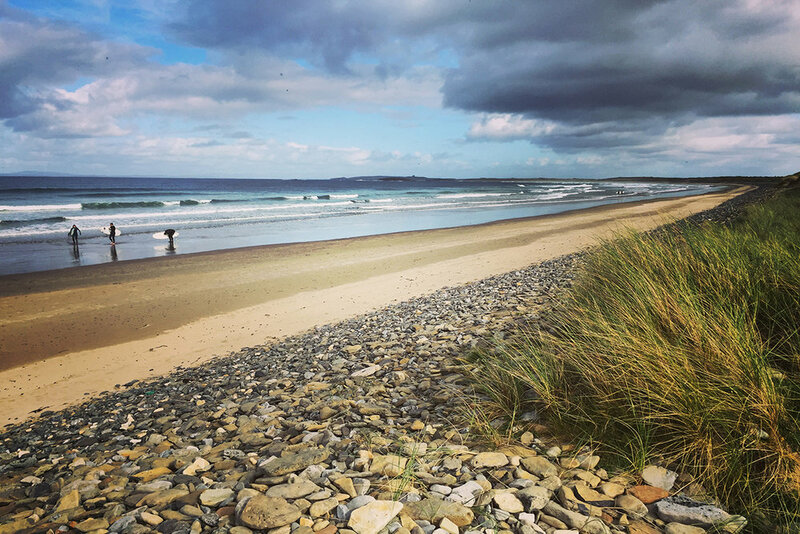 Streedagh Beach is approximately 2 & 1/2 hour drive from Galway. 165km taking the N17 (new motorway is a great addition) and N4.